Wait, What Am I Asking For? The purpose of a CTA (Call to Action) is to inspire your audience to take some form of action. In a sales or fundraising context, this action is also known as an “ask.” It is critical to define exactly what your goal/objective is in order to determine an appropriate CTA. Do you want a larger following online? Do you want more potential customers (leads)? Do you want existing donors to contribute more? Each CTA should inspire a specific action for a specific purpose. What Does My Audience Want in Return? It’s a seemingly simple question: what would motivate a member of your audience to respond to your CTA? At first glance, it may seem like a one-way street: the audience is completing the call to action for the benefit of the business. Thank you for your blind support, audience! Actually, a good call to action is more like an exchange where your audience will gain a direct benefit from completing your CTA. For example, your audience may agree to sign up for your eNewsletter in exchange for high-quality resources and information. If you can correctly identify what your audience wants, then you can make a compelling offer for your audience to complete your CTA. 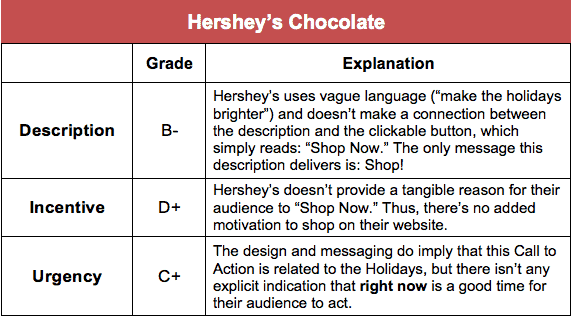 To help you design effective CTA, we’re going to compare two eCommerce designs: Hershey’s and Equal Exchange. Let’s assume that both companies have the same goal: to increase gift sales during the Holiday season. 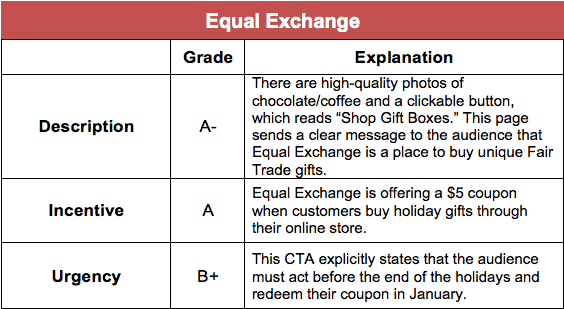 Now, let’s consider the effectiveness of each CTA based on the following criteria: description, incentive, and urgency. This is a Call to Action on the primary “Shop” page of the Hershey’s website. This is a Call to Action on the primary “Shop” page of the Equal Exchange website. A good CTA proposes a timely and fair exchange between your business/organization and your target audience. So, when you consider your own Calls to Action (and you do already have Calls to Action, regardless of whether or not you were previously familiar with that title), ask yourself: Is this proposal descriptive, incentivized and timely? Next Next post: How Can I Increase My Sales?